VOLUNTEER APPLICATIONS NOW OPEN FOR THE 2017 ECMAS! Want to help out at the ECMAs? 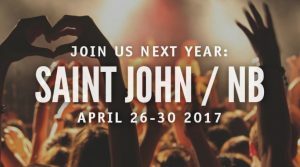 Then apply today to become a volunteer at the 2017 event in Saint John, April 26-30. The ECMAs is a five-day, non-stop musical celebration showcasing and recognizing the best of East Coast artists and music. The ultimate goal of this internationally recognized event is to position and promote it as the premiere music event for the public and the music industry in Canada and the conference of choice for artists and industry professionals. There are plenty of ways to volunteer at the 2017 ECMAs, from transportation to social media and much more. Click here to view a full list of opportunities and to apply.